SaferÂ® Brand Rose and Flower insect killer works as an insecticide. This product utilizes the power of potassium salts of fatty acids (insecticidal soap). The potassium salts weaken the insect's waxy protective outer shell and causes them to dehydrate and die. 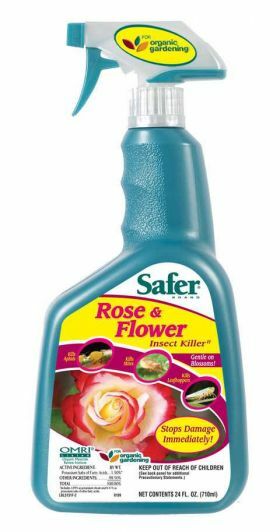 The ability to use this product in your home and in your lawn or garden makes it the most economical and convenient solution to pest annoyances available on the market for rose care! This product is OMRI ListedÂ® and compliant for use in organic gardening and does not kill beneficial insects when used as directed.